Picture your family vacation here! This oceanside home, just 125 yards from the beach, has something for everyone. 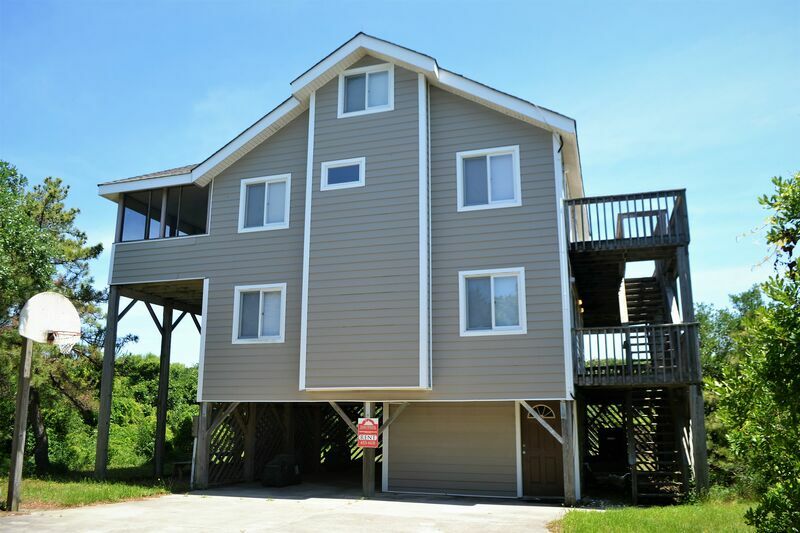 Kids and adults alike will enjoy the short walk to the beach, as well as the Basketball goal and high speed internet access. There are plenty of sun decks, shade decks and a large screened porch with picnic style seating. Don't want to clean up a mess in the kitchen? Grill some burgers and hot dogs and have family dinner outside. The kids will love it, too! GROUND LEVEL: Parking, Enclosed Outdoor Shower, Foot Wash, Basketball Goal, Entrance, Laundry. LEVEL 1: Queen Master Bedroom with east facing deck access, shares bathroom with Queen Bedroom also with east facing deck access. Twin Master Bedroom shares bath with Bunk Bedroom. LEVEL 2: Queen Bedroom with south facing deck access, Hall Bath with Jetted Tub, which opens to Great Room, Kitchen and Dining area. Slider from dining area goes out to Screened Porch with picnic table seating. Two ocean facing sliders off living room, and one slider to south facing deck. LEVEL 3: Loft with Futon.